7 Tips To Help You Focus In Age of Distraction: Are You Content Fried! This morning I learned a new word for information overload – “content fried” from a colleague at the Packard Foundation. It resonated. We have so much content in our professional lives. I’m talking about the stuff we consume daily to keep inform of our professional field. It comes speeding at us from our email boxes, social networks, kindles, and even paper and snail mail! We scan, we browse, we try to thoughtfully read the best stuff, and interact through online conversations. Then there’s the whole other world of organizational content that you need to consume or create to get stuff done! Reading, reviewing, commenting, writing, and editing content. For those of us who work on social media and networks, “content fried” is an occupational hazard. So, it is important for us to incorporate techniques in daily work life that reduce the chances of this happening. I’m finding that my learning and online work is a fast forward, swimming in the stream experience. I can’t possibly read everything, but I am using content curation skills to pick out the best stuff to give more attention to. I find I can only do that work at certain times of the day or only for so long. The biggest difficulty I experience is the shifting from this forward flowing process of consuming, curating, and sense-making of content to learn versus to get something done. The latter requires a different type of attention and whole new set of information coping skills. Howard Rheingold calls this process managing your attention or “Infoattention” and it is what he has been teaching in his courses. I’ve been trying to curate content that offers ideas, tips, and resources to get past that ugly feeling of “content fried.” He curated the above mindmap and when I shared this Google + , I discovered that nonprofit colleagues have the same struggle. I liked this map so much that I printed it out and keep at my desk. 1.) Manage Your Attention, Not Just Your Time: Don’t just create a to do list, lay it out on daily and weekly schedule, breaking down key tasks of the project to chunks. But consider the level of concentration and focus that each type of task or chunk requires – and schedule accordingly. For example, if I have to do some writing – that requires a higher level of attention for me than does scanning Twitter or reading and responding to email. I schedule my writing time during peak concentration hours in the day. (I’ve charted those – so I know when they occur). I also use a timer when I’m doing scanning my networks and time box those activities into 15-20 minute bursts. 2.) Visualize On Paper: Over the past 10 months, I’ve made a return to paper and markers and using mind maps or visualization techniques to reflect, plan my week or day. I use this as a pre-writing exercise as well as a reflection exercise. It’s why felt the need to dive into visual facilitation and thinking techniques as a way to cope with content fried. 3.) Establish Rituals: Rituals in your work life are valuable. The mindmap offers a lot of good suggestions for rituals – from decluttering your workspace to healthy habits like sleep and exercise. 4.) Reflection: Reflection doesn’t have to be a huge amount of time to be effective. I’m taking ten minutes every morning to practice some visual recording skills like drawing to create my “3 Most Important Things for Today List.” At the end of the day, I look at it, reflect on what I did – and plan for tomorrow. The advice is not to go online or check email until you get your three things done, but that is very hard for me – given so much of my work is online. What I do is try to avoid email first thing in the morning. 5.) Managing Email and Other Distractions: I’ve turned off notifications that pop up on my computer screen or send me a text message to my mobile phone. 6.) Managing Physical Space: When I see clutter in my physical work spaces, I try to take that as a sign that I need to hit a pause button. Usually it is because I’m doing too much. 7.) Just Say No: Maybe you are going to say no to social media for a day and go to meet with people, take a class, read a book, or talk a walk. When I’m feeling most overwhelmed, I take a break. Even if it is just to get up and walk around my desk. 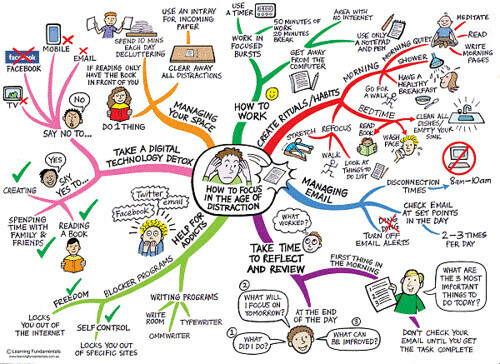 What are your tips to help you focus in an age of distraction? Are there tips not on the mind map? Have you read a helpful article or blog recently that helped get more focused? Ah, this is exactly what I needed today! I’ve been feeling that “content fryness” lately, and this checklist is just what I needed. Thanks, Beth! I turned off my email today for 4 hours, a practice I don’t usually undertake – but wow my productivity was way higher during those 4 hours. I had 75 emails after starting again, and it only took me 15 minutes to go through them all. Much faster than the constant distraction of getting your head back into a task after you check just one new email. Hope to maintain all the tips mentioned here!